Sprint became the first national US carrier to launch the Motorola RED RAZR V3m, a special edition of the iconic RAZR that is a part of the (PRODUCT) RED initiative. The group is headlined by U2 frontman Bono and raises money for those in Africa affected by HIV/AIDS. $17 will be donated for each handset sold. 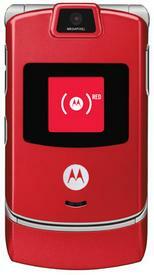 Sprint expects to begin shipping the RED RAZR V3m starting next month. It will be available for $64.99 with a 2-year contract or $304.99 with no contract. Another recent high profile RED launch was the iPod nano (PRODUCT) RED which retails for $199 and supports the charity with $10 per sale.